You’d think I would have more going on in my head in the moments before starting my climb out of the cockpit of the two seater biplane I was in, but it was mostly empty save for admiring the view and staring at the instruments in the panel in front of me. But how did we get here and why am I climbing out of an airplane while it was in the air? Let’s start with a little history lesson. Or you can skip to Making The Wing Walk to skip all that and my lead-up to the actual experience. I’ve also created a companion piece going in depth into the training and how you try out wing walking for yourself. You can find a link at the bottom of the story as well. 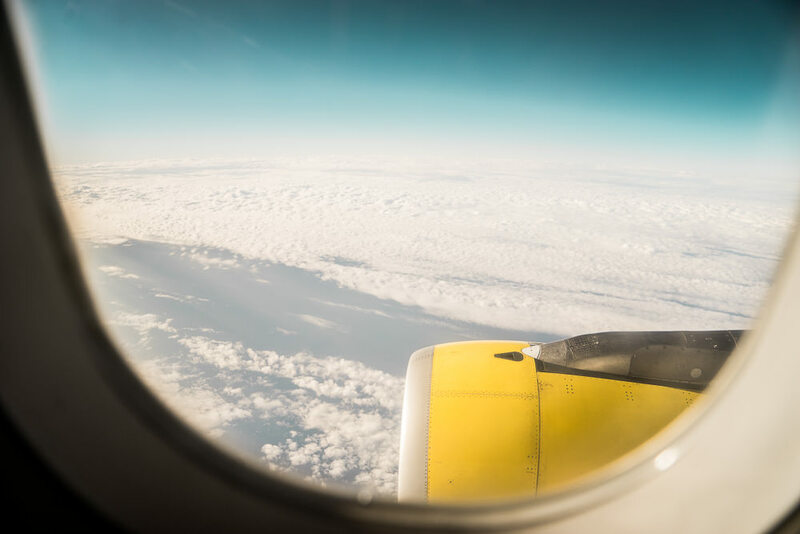 Not long after the Wright Brothers invented the airplane did the entrepreneurial minds of the time began concocting up plans to entertain the masses while promoting flying and airplanes in general. 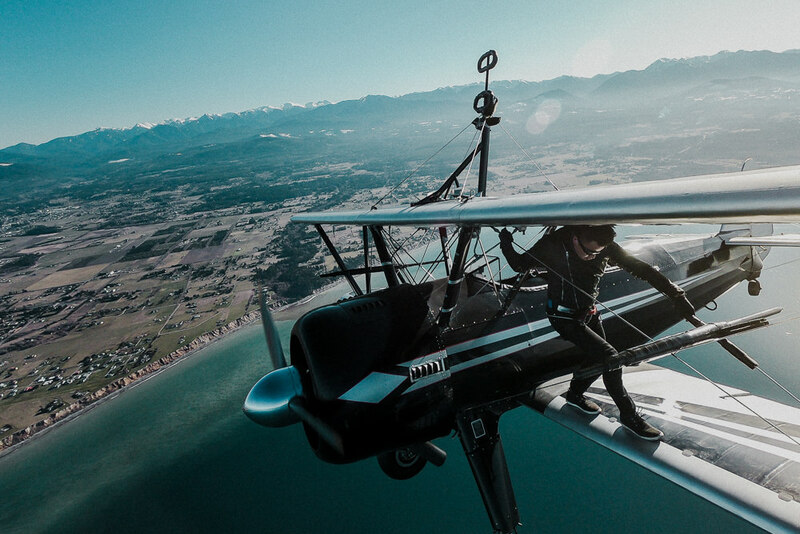 Daring pilots began performing aerial stunts across the countries, one-upping each other, for fame and a bit of fortune. 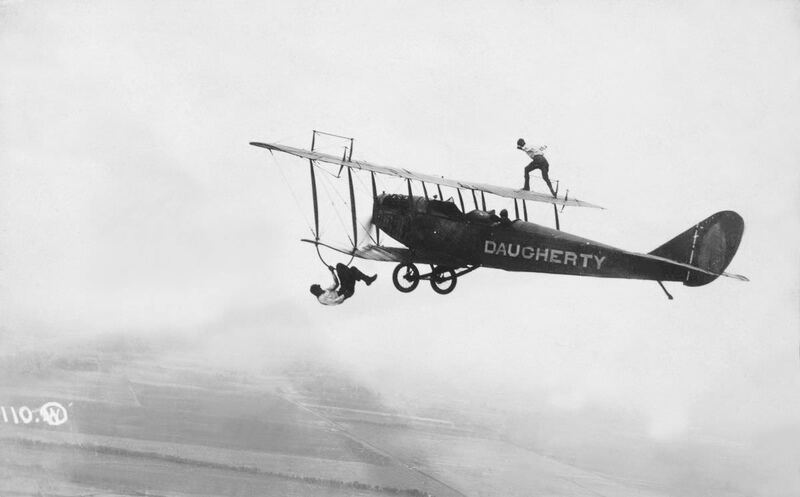 Eventually, it got to the point where the stunts involved the pilot themselves and not just the plane. 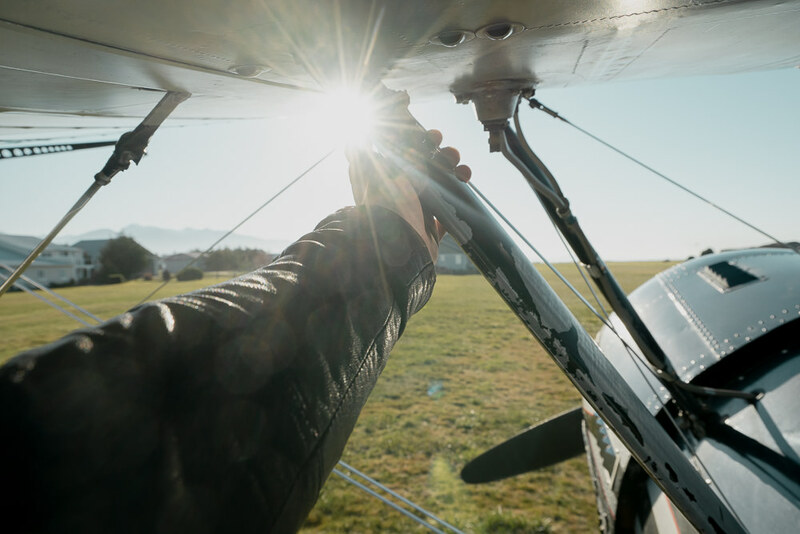 The story goes that a U.S. Army Air Service pilot named Ormer Locklear would walk onto the wings of his plane during training to fix mechanical issues mid-air without having to land. 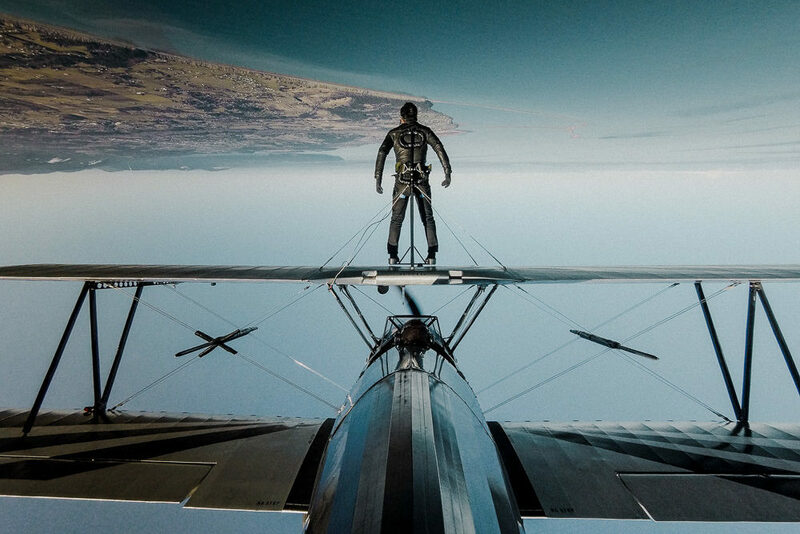 He would later go on to be one of the first daredevil to perform stunts to the public as part of the “barnstorming” aerial show movement of the 1920s. He would also eventually meet his end during a wing walking stunt. 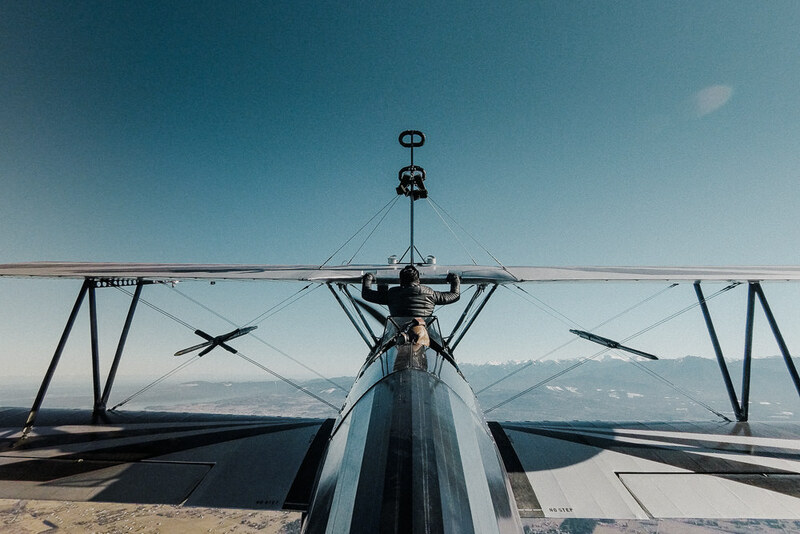 From a practical standpoint, wing walkers were also used to perform mid-air refueling for the U.S. Air Corps, walking with a fuel pack from one plane to another to refuel and allow for longer distance flights. And then it was mostly forgotten about by the public. 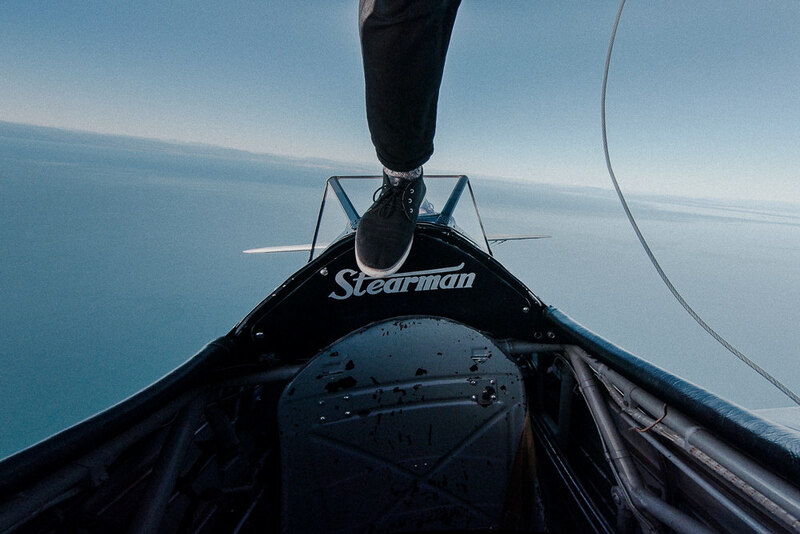 When I first put my Bucket List together, wing walking did not make the list. Not for a lack of want, but simply because I did not think or know that something like this was even an option. Until I did. 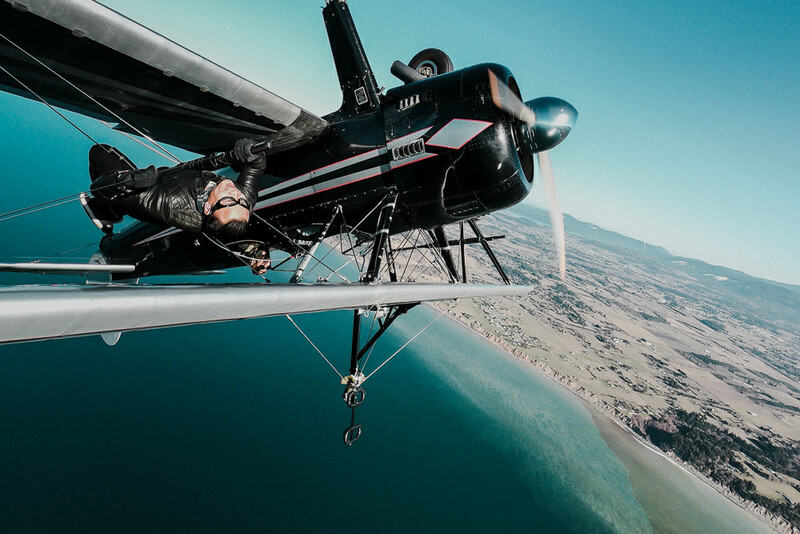 On a flight to London last summer, I saw a video pop up on Facebook of someone standing on top of an old biplane, similar to one that I did an aerobatic stunt flight on while in New Zealand. 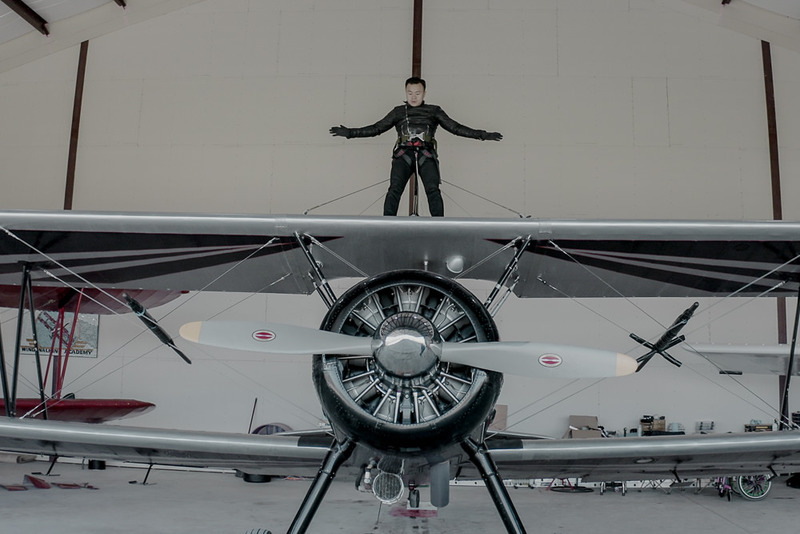 And, no way, they were also doing stunts, with the person attached to the wing somehow. 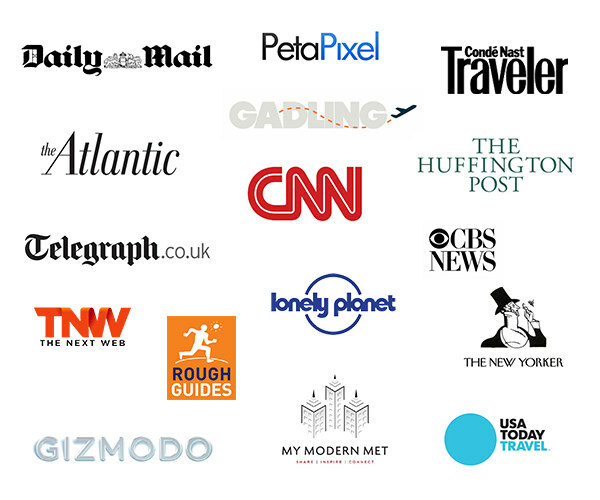 I immediately googled “wing walking UK” and came across a couple of wing riding websites. I emailed them and asked if there was any availability the next day. Unfortunately, they could not accommodate me on such short notice before I had to leave. Of course, when something like this find its way into my consciousness, it’s hard to shake it, so as soon as I got back home, I did another Google search for “wing walking USA”. And the Mason Wing Walking Academy in Sequim, Washington popped up. They did not offer “wing riding,” where you are attached to the an upright rig on the upper wing from start to finish, but instead a proper “wing walking” experience complete with training so you can climb out of the cockpit and actually climb up and walk around the wings. I had to do this. In some ways, it was all a matter of time. And that time came in the March of 2019. I was in Sao Paolo, Brazil on an around the world shoot for Daimler and Mercedes Benz, when I received an email from a producer at CNN who wanted to know if I was planning on doing any “once in a lifetime” trips over the next couple of months. My March was wide open and I had a couple of adventures I’d been meaning to get to. Almost too casually, I threw out free diving the Blue Hole in Belize, diving Darwin’s Arch in the Galapagos, or wing walking in Washington. “What’s wing walking?” was his response. This would be the same response I would get from everyone in the ensuing weeks. 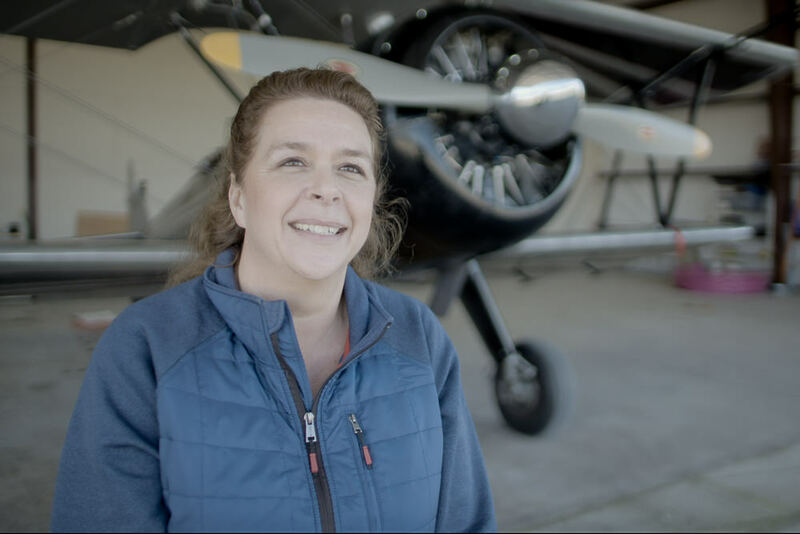 It took a bit of being flexible on everyone’s part and a lot of luck with the weather, but it all came together with a plan to fly on March 17th. CNN sent out one of their documentary filmmaker and producer, Alfie, to meet me in Seattle and we drove up the day before to set up additional cameras on the plane and shoot interviews. 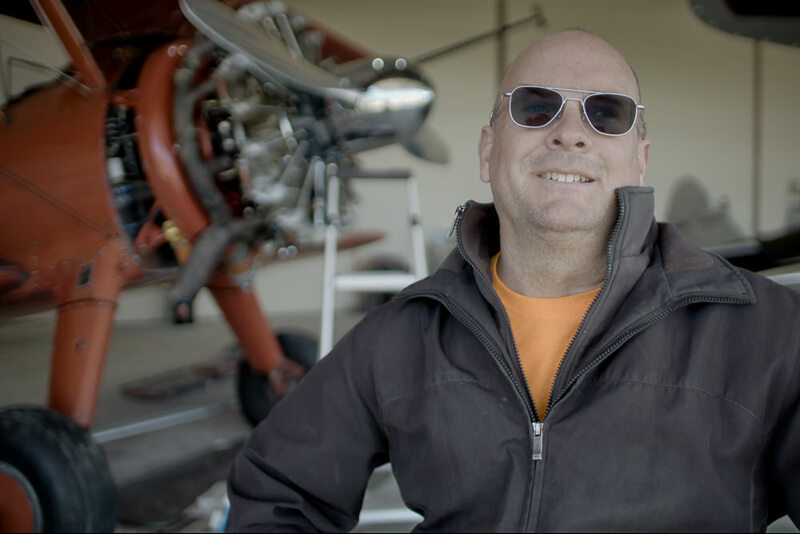 Perhaps it was the distraction of having them make a short episode about this experience, but even after meeting the Masons and seeing the black 1943 Stearman biplane that I would be flying in, the whole walking on the wing thing still did not completely register in my head. And it really didn’t throughout the most of the training day right up to the flight. Even now, I can’t quite explain it. We met Mike and Marilyn the day before our flight to prepare for CNN’s shoot the following day. They live with their 7 children in a flying community in Sequim. The setting is just incredible. We drove up to a massive hangar that houses the two Stearmans they use for aerobatic flights. Just in front is a long grass runaway out straight to an ocean bluff. Behind them are the mountains ranges of the Olympics National Park. Mike is a very straightforward guy, who flies chartered flights out of Southern California and commutes between the two place. 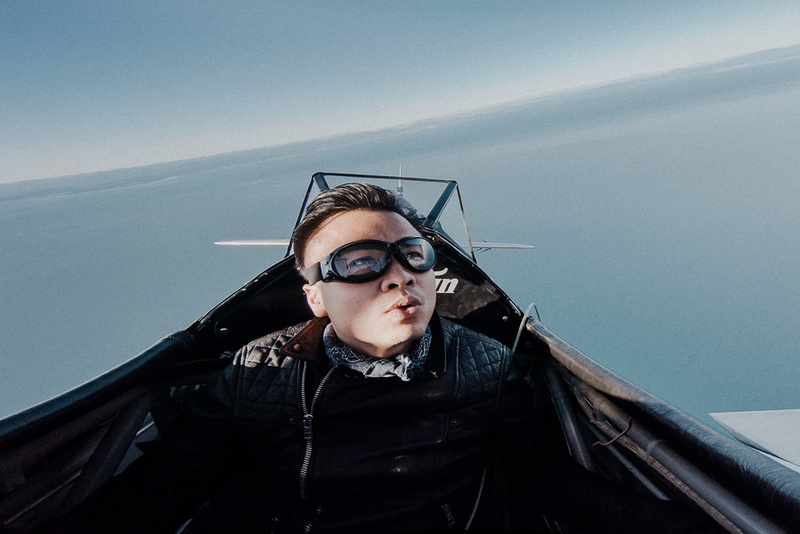 He comes from a family of aerobatic stunt pilots, so it runs in his blood and he’s been doing this all his life. This is the type of guy you go to if you want to do something like this. It takes a lot of confidence to accept the risks that comes with providing this type of training to just about anyone. Marilyn, the wife part of the duo, has an incredible knack for making you feel comfortable and at ease. We started cracking jokes as soon as we met, and the whole thing just felt so matter of fact. For the next few hours, she walked me through the set of movements I’d be making to get to the top wing and then out to the side wing. The main takeaway was to always have 3 points of contact at all times. Two feet and one hand or two hands and one foot. And so we imagined the flight and trained the moves into muscle memory. 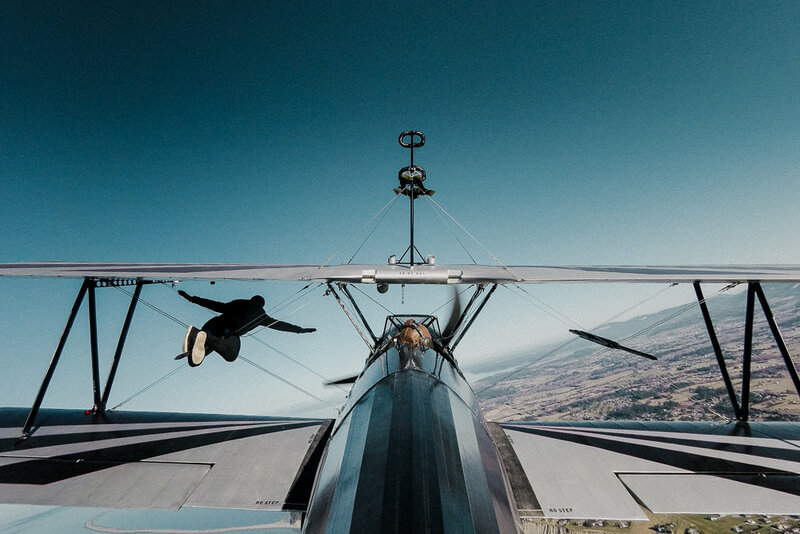 I go into the training in-depth over in this Everything You Need To Know About Wing Walking For The First Time companion article. Throughout the day, Marilyn kept reminding me to not forget to relax and look at the camera too. I love it. Picture or it didn’t happen right? Here’s a fun Mason family fact. 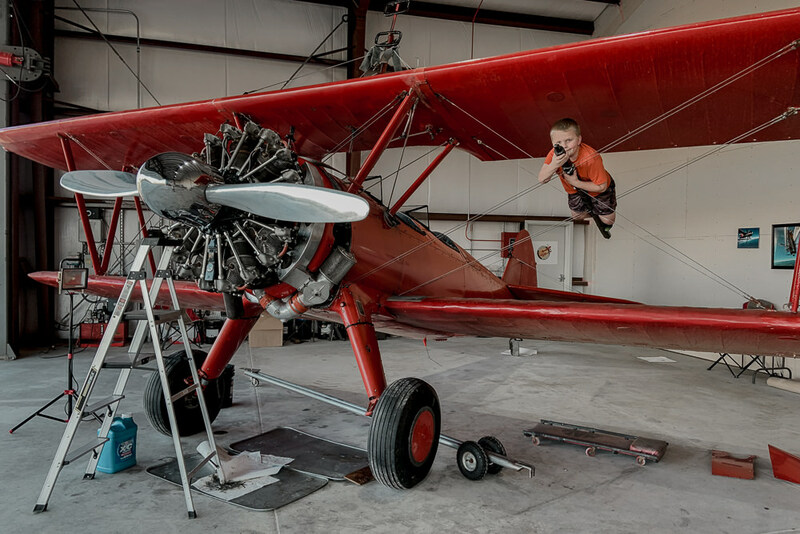 As soon as their kids turn 10, they allow them to wing walk. 10 years old. That blew my mind, until I realize that these kids grew up around this and they are probably much more confident and aware of all the risks and nuances of it than most people who come for the day and take off. But 10. Wow. After the first part of the training was complete, we took a lunch break where I ordered an elk burger “as rare as you can make it” rare and a clam chowder. I think it’s important to note that this is NOT a meal I would normally recommend for anyone ahead of what I expected to be a stomach churning adrenaline ride. But I ordered it without much thought. That should speak to how little this whole thing was registering in my even a couple of hours out from the flight. In fact, after lunch, I casually asked Marilyn if I could take a 30 minute nap before continuing the training. And I passed out immediately in the back seat of the car. A lovely post-lunch siesta. The last part of the training was repeating all the moves with while tied to to the 6 foot braided safety cable. This would be attached to me the whole time as a back-up in case I did fall off the plane. I’m pretty certain it would hold the weight of my body if it happens to get violently blown away by the wind, but I would NOT rely on this thought to bring you any comfort. Just plan NOT to slip and fall. I can’t imagine it’d be that easy to climb back on while dangling from a cable at your hips going somewhere between 60 and 100 mph. And here is what I loved about Mike, who is a man of few words. When I asked about how I’d get back on the plane if that were to happen, he said the landing strip was made of grass. I couldn’t tell if he was joking and this is where the unamused emoji 😒would be most aptly used. So basically, don’t fall off. After a couple of walk-throughs accounting for the safety cable, I was starting to zone out. At the point, I was going through the movements instinctively, and wasn’t thinking about it anymore. Marilyn said we can go up whenever I was ready. I don’t know if I was, but I also didn’t feel like I wasn’t getting anything else out of doing another walk through, so I gave the Masons the go ahead to fire up the engine. 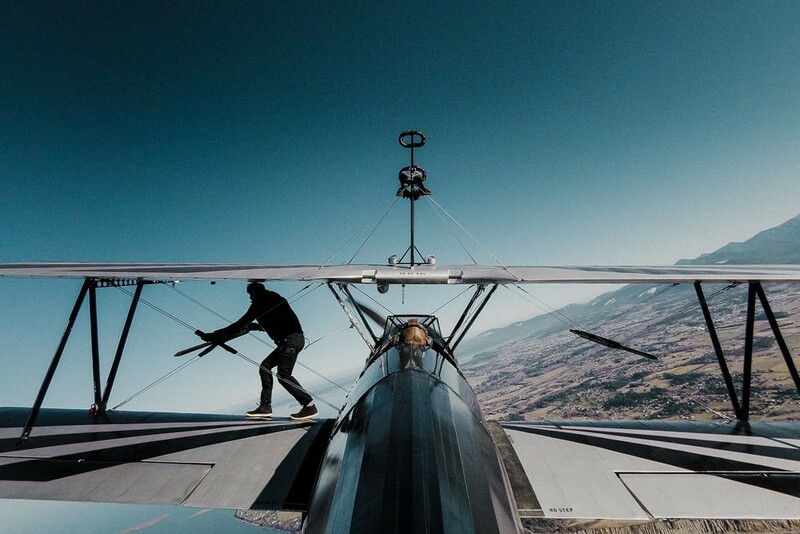 So what was wing walking actually like? Making that deliberate decision to unbuckle my seatbelt and begin the climb out of the cockpit was by far and away the most worthwhile part of the whole experience. Following the signal from Mike, I put my left hand up again and felt the force of the 60 mph+ winds that I would be fighting against. I snapped into absolute focus that I honestly had no time to be nervous or afraid. I never felt for a second that I would slip or fall off, so the real climb felt very similar to all my practice climbs while the plane was on the ground. The difference was obviously the wind and countering it. Each move was deliberate and I always maintained 3 points of contact. For some reason, I felt like if I did just that, I was perfectly safe. Once my right foot left the front of the pilot’s cockpit, I was fully exposed, as I expected to feel. There was nothing in front of behind me. In hindsight, I have to give so much props to Mike for keeping the plane steady during this time. At the top, while standing fully extended with just the metal rest at my back, I had to let go of any holds or cables to blindly unbuckle the harness belt behind me. During this time, any wobble, tilts, dips, or even an angry bird could have made things pretty sketchy. To Mike’s credit, none of that happened and I was able to quickly secure myself for the next part of the flight. I still don’t fully understand the physics behind what kept me from falling off or feeling like I was falling off while I was upside down, but it felt secure enough for me to throw my arms out to the sides “king of the world” style during the flips. Marilyn had told me earlier that the “hammerhead” was her favorite stunt. And it would be mine too. 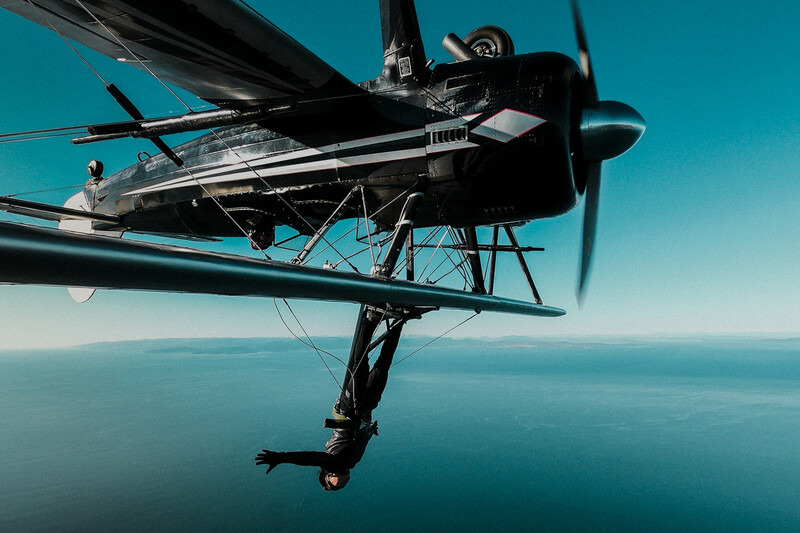 For this move, Mike would dip the plane down and then straight up in the air before, turning it over and diving straight back down. THAT WAS SO MUCH FUN and where I felt the longest bit of weightlessness. 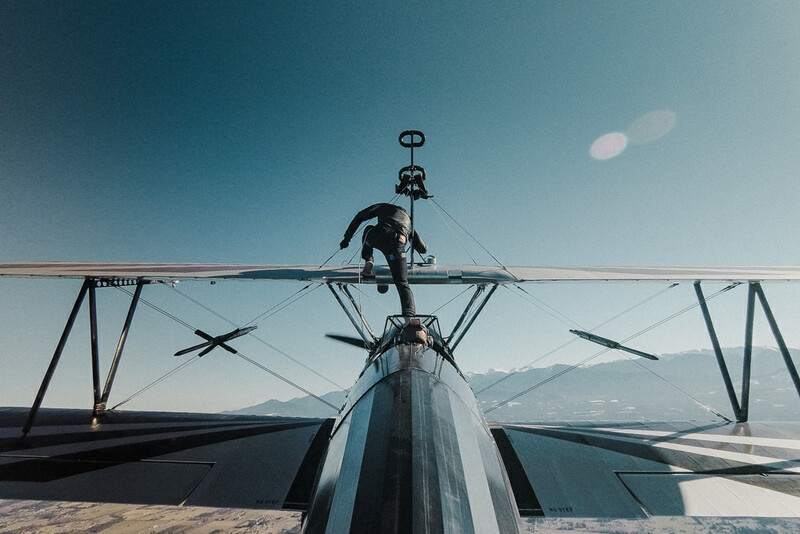 When we were done with the stunts, Mike gave me a few minutes to just catch my breath and take it all in before signaling with a plane wobble for me to climb back down. With the rush of adrenaline, I didn’t think about the fact that I was now climbing backwards off a wing into the cockpit while the plane was still flying. I didn’t even feel the force of the wind like I did the first time going up. Safely back in my seat, it finally hit me that I just did it. I wing-walked. I don’t remember this, but I looked up at the cockpit camera we mounted and mimed the “mind blown” thing. But we weren’t done. And before I knew it, I got the signal to climb back out for the second part of the walk, on the lower wing. This was the more complicated part of the walk since I’d be walking perpendicular to the wind while trying to step on those marked spots that could support my weight. But since ever step and hand hold was planned ahead of time, it went exactly like we trained with the exception of trying to carefully plant each foot down on the right spots fighting against the wind. It’s Wingardium Levi-O-sa, Not Levio-SA! After getting into broomstick position, did I perform an imaginary spell with an imaginary wand instead of holding on to the javelin? You damn better believe I did. This was a very secure position so we didn’t need any additional harness during the acrobatics. Other than feeling even more of the wind, everything went as expected and I once again gave the thumbs up for Mike to start the flips. The feeling was very similar, but also quite different because I was now in a horizontal position clinging to a bar. I screamed with so much joy that they heard me back down on the ground a few thousand feet away. 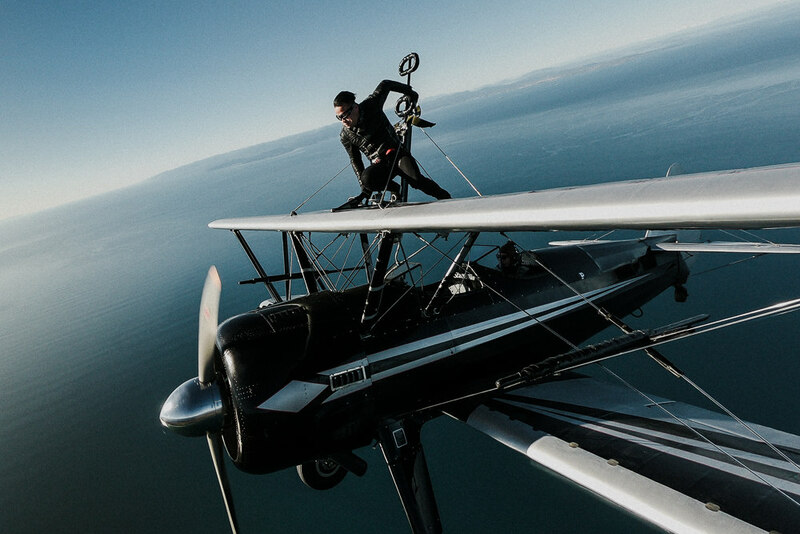 Once we finished with the stunts, I just took my time to play around for the cameras and to take it all in again. I may or may not have acted out some scenes from movies along with an assortment of dance moves. It would be over soon enough. You have to make the most of it. Once I made the walk back into the cockpit, it was just a matter of landing to complete the journey from inception as part of the Bucket List to seeing it through safely and successfully. And like that, it was over. In some way I was glad, mostly for my parents sake and those who genuinely worried about my well-being in the days leading up to the walk. I knew the whole thing would only last less than half an hour, so I wasn’t holding onto trying to get any more out of it than I did. It was everything I could ask for, and the I could not have asked for a more serendipitous day to do it along with the best weather we could have gotten in March. The idea of risk and safety is all relative. I know it’s not a straightforward answer, but while I don’t consider myself an adrenaline junkie or a huge risk-taker. 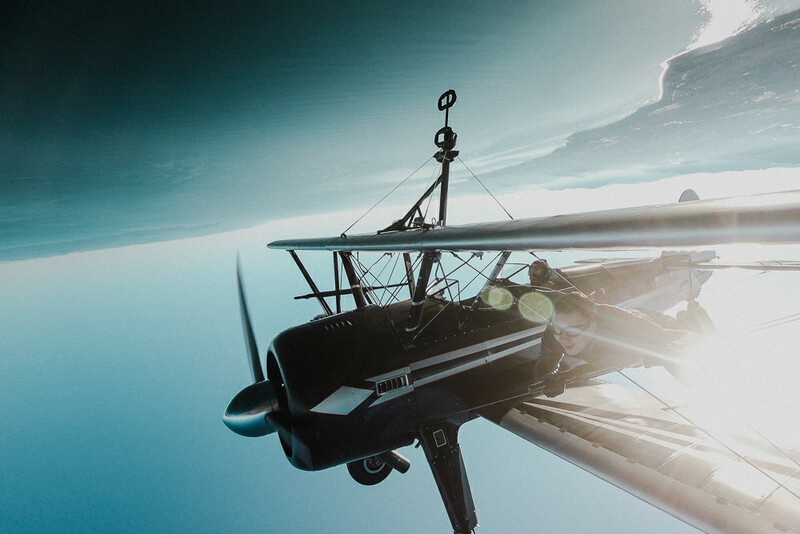 I evaluate the risk involved in most things I do, and while it’s possible that I could slip and off and dangle off a cable from an old 1940s era biplane, I considered it a low probability as long as I followed the training instructions and gave it my complete focus. I feel safe climbing around a jungle gym and this is basically the same thing, but the idea that you are doing it in the air with some wind makes it more daunting that it is really is. I’m not trying to downplay it, but I really think that it’s 90% mental and 10% physical. As long as you can do it on the ground, you can do it in the air. It’s merely the idea of it that keeps most people from entertaining the possibility of doing something like this. I honestly find so many other things we do in our day to day lives much more of a risk than something like this. 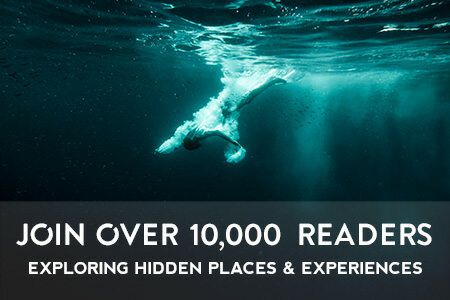 So, be brave, embrace the curiosities of life, and consider putting this on your own bucket list. 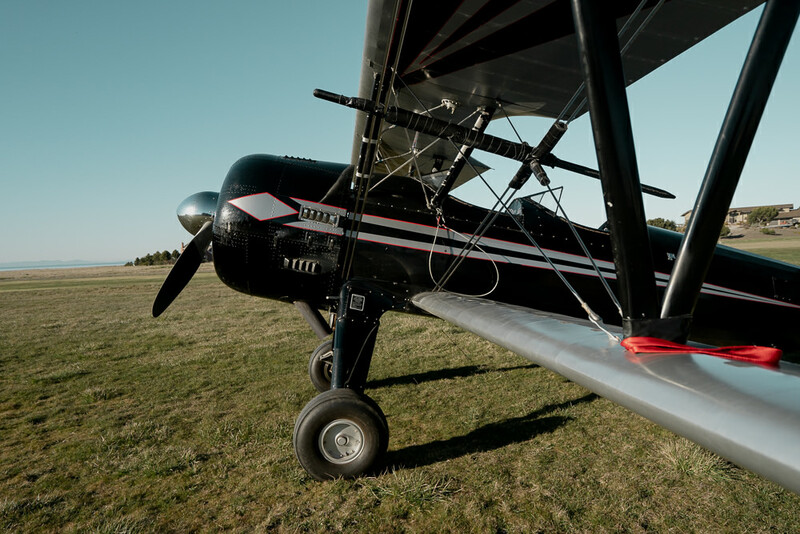 You can read this companion piece to find out Everything You Need To Know About Wing Walking For The First Time.